Meet Blossfeldia liliputana, the smallest species of cactus in the world. With a maximum diameter of only 12 mm, this wonderful succulent would be hard to spot tucked in among the nooks and crannies of rock outcrops. Its species name "liliputana" is a reference to the fictional island of Liliput (Gulliver's Travels) whose inhabitants were said to be rather small. If its size alone wasn't interesting in and of itself, the biology of B. liliputana is also downright bizarre. B. liliputana is native to arid regions between southern Bolivia and northern Argentina. It appears to prefer growing wedged between cracks in rock as these are usually the spots where just enough soil builds up to put down its roots. Root formation, however, does not happen for quite some time. Most often new individuals bud off from the parent plant. They emerge not from the base, but rather from apical tissues, yet another unique feature of this cactus. What's more, this cactus produces no spines. Instead, its numerous areoles are covered in a dense layer of trichomes that are rather felt-like to the touch. As you can clearly see, this species is small. It only ever becomes conspicuous when it comes time to flower. Imagine a bunch of tiny white to pink cactus flowers poking out of a crevice. It must be a remarkable sight to see in person. Despite their showy appearance, its is believed that most are self-fertilized. As mentioned, the size of this cactus isn't the only interesting thing about its biology. B. liliputana is categorized as a poikilohydric organism, meaning it doesn't have the ability to regulate its internal water content. Researchers have found that individual plants can lose up to 80% of their weight in water and can maintain that state for as long as two years without any negative effects. As such, colonies of these tiny cacti often appear shrunken or squished. Once the rains arrive, however, it springs back to its original rounded shape with seemingly no issues. Amazingly, a significant amount of water uptake happens via the fuzzy areoles that cover its surface, hence it does not harm the plant to hold off growing roots for quite some time. Speaking of water regulation, B. liliputana holds another record for having the lowest density of stomata of any terrestrial autotrophic vascular plant. Stomata are the pores in which plants regulate water and gas exchange so having so few may have something to do with why this species loses and gains water to such a degree that would kill most other vascular plant species. Another peculiar quality of this cactus are its seeds. Unlike all other cacti whose seeds are hard and relatively smooth, the seeds of B. liliputana are hairy. Attached to each seed is a small fleshy structure called an aril, which aids in seed dispersal. As it turns out, B. liliputana relies on ants as its main seed dispersers. Ants attracted to the fleshy aril drag the seeds back to their nests, remove and eat the aril, and then discard the seed. This is often good news for the cactus because its seeds end up in nutrient-rich ant middens protected from both the elements and seed predators, often in much more suitable conditions for germination. Needless to say, B. liliputana is a bit of an oddball as far as cacti are concerned. Its highly derived features coupled with its bizarre biology has made it difficult for taxonomists to elucidate its relationship to the rest of the cactus family. 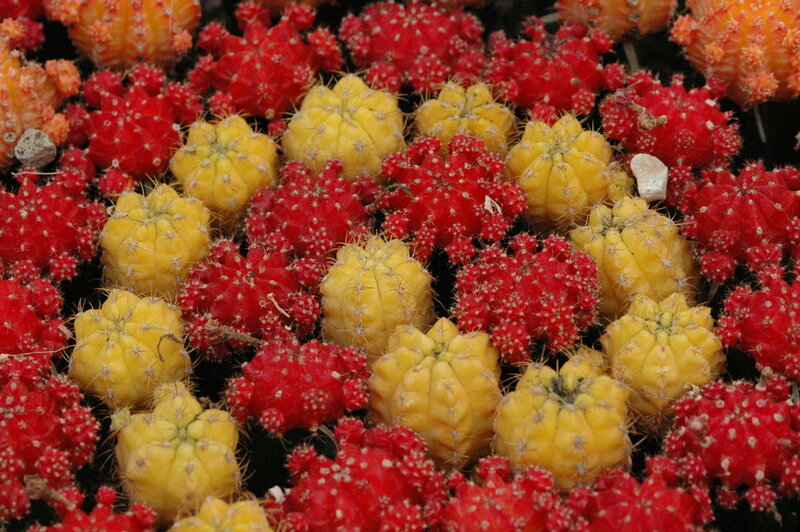 It certainly deserves its own genus, to which it is the only member, however, it has been added to and removed form a handful of cactus subfamilies over the years. The most recent genetic analyses suggests that it is unique enough to warrant its own tribe within Cactaceae - Blossfeldieae. At first glance, there is little about a Pereskia that would suggest a relation to what we know as cacti. Even a second, third, and forth glance probably wouldn't do much to persuade the casual observer that these plants have a place on cacti family tree. All preconceptions aside, Pereskia are in fact members of the family Cactaceae and quite interesting ones at that. Most people readily recognize the leafless, spiny green stems of a cactus. Indeed, this would appear to be a unifying character of the family. Pereskia is proof that this is not the case. Though other cacti occasionally produce either tiny, vestigial leaves or stubby succulent leaves, Pereskia really break the mold by producing broad, flattened leaves with only a hint of succulence. Pereskia spines are produced from areoles in typical cactus fashion. What's more, instead of clusters of Opuntia-like pads or large, columnar trunks, Pereskia are mainly shrubby plants with a handful of scrambling climbers mixed in. Similar to their more succulent cousins, the trunks of Pereskia are usually adorned with clusters of long spines for protection. 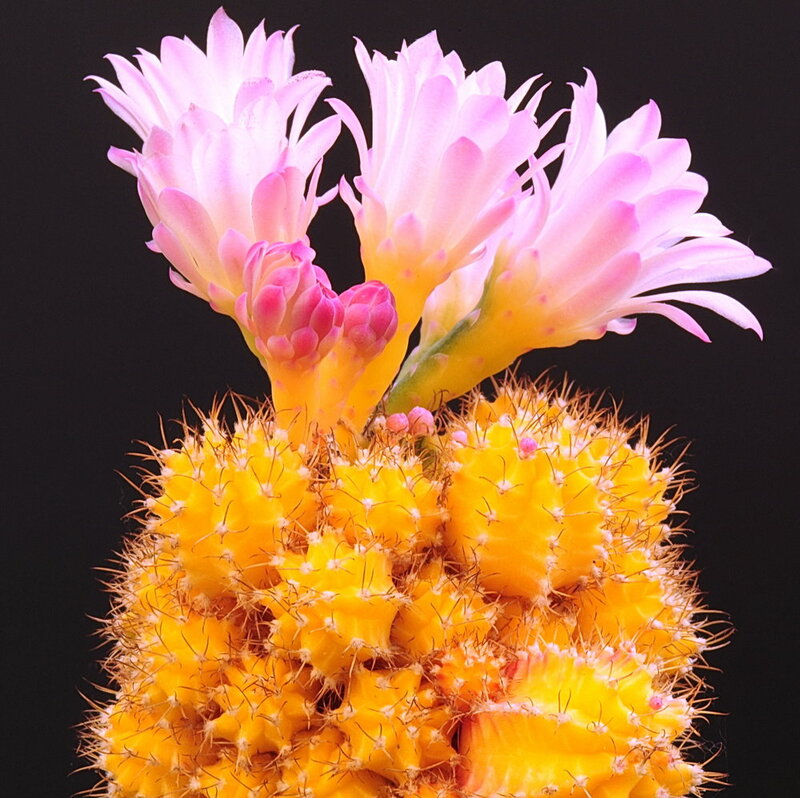 Additionally, each species produces the large, showy, cup-like blooms we have come to expect from cacti. They are certainly as odd as they are beautiful. As it stands right now, taxonomists recognize two clades of Pereskia - Clade A, which are native to a region comprising the Gulf of Mexico and Caribbean Sea (this group is currently listed under the name Leuenbergeria) and Clade B, which are native to regions just south of the Amazon Basin. This may seem superficial to most of us but the distinction between these groups has a lot to teach us about the evolution of what we know of as cacti. Genetically speaking, the genus Pereskia sorts out at the base of the cactus family tree. Pereskia are in fact sister to all other cacti. This is where the distinction between the two Pereskia clades gets interesting. Clade A appears to be the older of the two and all members of this group form bark early on in their development and their stems lack a feature present in all other cacti - stomata. Stomata are microscopic pours that allow the exchange of gases like CO2 and oxygen. Clabe B, on the other hand, delay bark formation until later in life and all of them produce stomata on their stems. The reason this distinction is important is because all other cacti produce stomata on their stems as well. As such, their base at the bottom of the cactus tree not only shows us what the ancestral from of cactus must have looked like, it also paints a relatively detailed picture of the evolutionary trajectory of subsequent cacti lineages. It would appear that the ancestor of all cacti started out as leafy shrubs that lacked the ability to perform stem photosynthesis. Subsequent evolution saw a delay in bark formation, the presence of stomata on the stem, and the start of stem photosynthesis, which is a defining feature of all other cacti. If you are as excited about Pereskia as I am, then you , my friend, are in luck. A handful of Pereskia species have found their way into the horticulture trade. With a little luck attention to detail, you too can share you home with one of these wonderful plants. Just be warned, they get tall and their spines, which are often hidden by the leaves, are a force to be reckoned with. Tread lightly with these wonderfully odd cacti. Celebrate their as the evolutionary wonders that they are! Where does one begin with a plant like the saguaro cactus (Carnegiea gigantea)? It is recognized the world over for its iconic appearance yet its native range is disproportionately small compared to its popularity. It is easily one of the most spectacular plants I have ever encountered and I will never forget the sound the wind makes as it blows over its spiny pleated trunk. It would be impossible to sum up our collective knowledge of this species in one article, however, I feel that some form of an introduction is necessary. Today I want to honor this icon of the Sonoran Desert. The saguaro is the only member of the genus Carnegiea, which is part of a subtribe of cacti characterized by their columnar appearance. Despite its unique taxonomic affinity, the evolutionary origins of this cactus remains a bit of a mystery. Though it is undoubtedly related to other columnar cacti of the Americas, a proper family tree seems to be just out of our reach. Due to lots of convergent and parallel evolution as well as conflicts between genealogies and species histories, we still aren't sure of its evolutionary origins. What we do know about this species on a genetic level is nonetheless quite interesting. For instance the saguaro has one of the smallest chloroplast genomes of any non-parasitic plant and we aren’t exactly sure why this is the case. Saguaro are long lived cacti. Estimating age of a cactus can be rather tricky considering that they don’t produce annual growth rings. This is where long term monitoring projects have come in handy. By observing hundreds of saguaro throughout the Sonoran Desert, experts believe that saguaro can regularly reach ages of 150 to 170 years and some individuals may be able to live for more than 200 years. Amazingly, it is thought that saguaro will not begin to grow their characteristic arms until they reach somewhere around 50 to 100 years of age. That being said, some saguaro never bother growing arms. It all depends on where the conditions they experience throughout their lifetime. Growth for a saguaro depends on where they are rooted. Under favorable conditions, a saguaro can grow to heights of 50 feet or more, with the world record holder clocking in at a whopping 78 feet in height. Such growth becomes all the more impressive when you realize just how agonizingly slow the process can be. Studies have shown that juvenile saguaro only put on about 1.5 inches of growth in their first eight years of life. Despite preconceived notions about the hardy nature of most cacti, saguaro have proven to be rather specific in their needs. They are limited in their growth and distribution by the availability of water and warm temperatures. Saguaro, especially young individuals, cannot tolerate periods of prolonged frost. Additionally, germination and seedling survival occur most frequently only during the wettest years. In fact, one study showed that successful years for reproduction in these beloved cacti were tied to volcanic eruptions that cooled the climate just enough to allow the young saguaro to become established. Outside of volcanic eruptions, saguaro appear to have friends in the surrounding vegetation. Studies have shown that saguaro seedlings seem to do best when growing under the shade of trees like the palo verde (Parkinsonia florida), ironwood (Olneya tesota), and mesquite (Prosopis velutina). The microclimates produced by these trees are much more favorable for saguaro growth than are open desert conditions. In essence, these trees serve as nurseries for young saguaro until they are large enough to handle more exposed conditions. 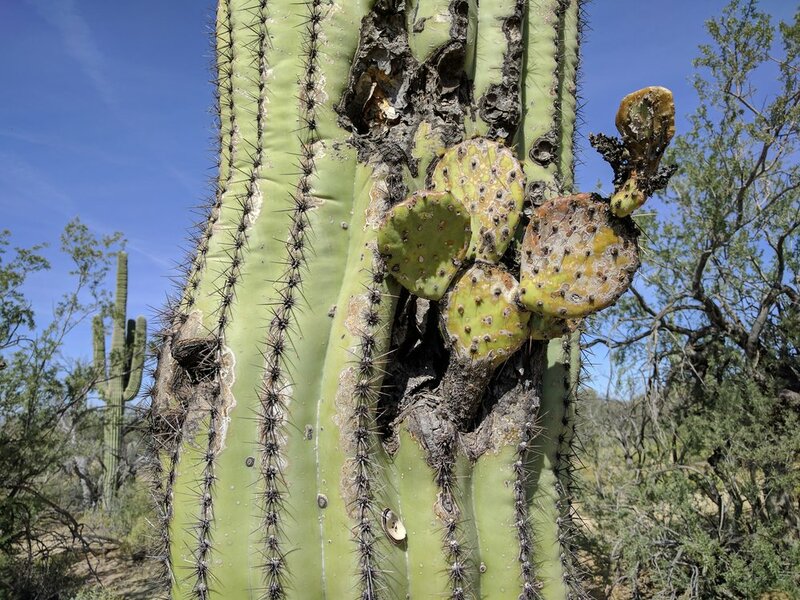 Their nursery habits are not mutually beneficial however as research suggests that saguaro eventually compete with the trees that once protected them for precious resources like nutrients and water. Saguaros outgrowing their palo verde nurse tree. At roughly 35 years of age, a saguaro will begin to flower. Flowers are small compared to the size of the cactus but they are abundant. Most flowers are produced at the apex of the cactus and it is thought that the growth of saguaro arms is largely a way of increasing the reproductive potential of large individuals. The flowers are cream colored and night scented. They open in the evening but will stay open and continue to produce nectar well into the morning hours. Though a wide variety of animals will visit these flowers, the main pollinators are bees during the day and lesser long-nosed bats at night. Interestingly, it has been found that certain amino acids within the nectar of the saguaro can actually help female bats sustain lactation while raising their young, making them a valuable food source for these flying mammals. Catering to such a broad spectrum of potential pollinators is thought to have evolved as a means of increasing seed set. Each saguaro ovary contains many ovules and the more pollen that makes it onto the stigma, the more seeds will be produced. A lesser long-nosed bat pollinates a saguaro bloom. Due to their size and abundance, it is easy to understand why the saguaro is such an ecologically important species in the Sonoran Desert ecosystem. In essence, they function similar to trees in that they serve as vital sources of shelter and food for myriad desert animals. 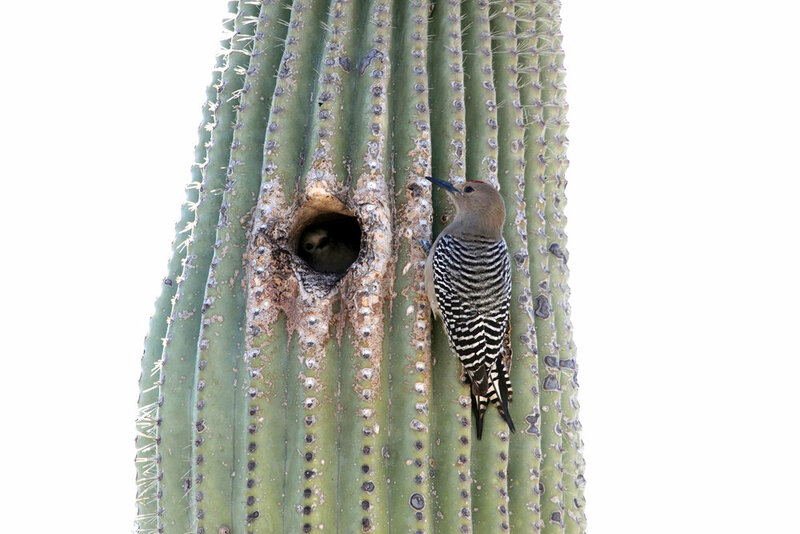 Woodpeckers, especially the gila and the gilded flicker, regularly hollow out and build nests in saguaro trunks. These hollows are subsequently used by many different bird, mammal, and reptile species. The flowers and fruits are important sources of food for wildlife. Gila woodpecker with its nesting hole. Gila woodpecker holes become homes for other birds like owls. On rare occasions, woodpecker holes can even become home to other cacti! I sincerely hope that this brief introduction does at least some justice to the wonderful organism that is the saguaro cactus. The Sonoran Desert would be a shell of an ecosystem without its presence. What’s more, it has played a significant role in the culture of this region for millennia. Though it appears quite numerous on the landscape, the long-term status of the saguaro is cause for concern. Numerous declines have been reported throughout its range. With its slow growth rates and infrequent recruitment events, the saguaro can be quite sensitive to rapid changes in its environment. Luckily it has received special protection laws throughout its US range. When we think of cacti, we tend to think of dry deserts and sandy soils. Few of us would ever jump to the trunk of a tree, nestled in a humid rainforest, and experiencing periodic inundation. Yet, such a habitat is the hallmark of one of the world's strangest species of cactus - Selenicereus witii. In more ways than one, this species is truly aberrant. Whereas epiphytic cacti aren't novel, the habits of S. witii surely push the limits of what we know about the entire cactus family. Despite having been discovered in 1899, little attention has been paid to this epiphytic cactus. What we do know comes from scant herbarium records and careful observation by a small handful of botanists. S. witii is endemic to a region of central Amazonia and only grows in Igapó, or seasonally flooded, blackwater forests. It makes its living on the trunks of trees and its entire morphology seems particularly adapted to such a harsh lifestyle. Unlike most cacti, S. witii doesn't seem to bother with water storage. Instead, its stems grow completely appressed to the trunks of trees. Roots emerge from near the spine-bearing areoles and these help to anchor it in place. Because they are often exposed to bright sunlight, the stems produce high amounts of chemical pigments called betalains. These act as sun block, protecting the sensitive photosynthetic machinery from too much solar radiation. These pigments also give the plant a deep red or purple color that really stands out against the trunks of trees. Like all members of this genus, S. witii produces absolutely stunning flowers. However, to see them, your best bet is to venture out at night. Flowers usually begin to open just after sundown and will be closed by morning. And my, what flowers they are! Individual blooms can be upwards of 27 cm long and 12.5 cm wide (10 in by 5 in)! They are also said to produce an intense fragrance. Much of their incredible length is a nectar tube that seems to be catered to a specific group of sphinx moths, whose proboscis is long enough to reach the nectar at the bottom. The seeds of S. witii are just as aberrant as the rest of the cactus. They are rather large and shaped like a kidney. Cross sections reveal that most of their size is devoted to hollow air chambers. Indeed, the seeds float like tiny pieces of cork when placed in water. This is likely an adaptation resulting from their preferred habitat. As mentioned above, S. witii has only been found growing in seasonally flooded forests. What's more, plants only occur on the trunks of large trees right at the high water line. In fact, the highly appressed nature of its stems seems to suggest that this species can withstand periodic submergence in fast flowing water. The seeds must also cope with flooding and it is likely that their buoyant nature aids in seed dispersal during these periods. All in all, this is one weird cactus. Although it isn't alone in its tropical epiphytic habit, it certainly takes the cake for being one of the most derived. Aside from a few publications, little attention has been given to this oddball. It would appear that the seasonal flooding of its preferred habitat has simply chased this cactus up into the trees, the environmental demands of which coaxed out strange but ingenious adaptations from its genome. The good news is that where it does occur, S. witii seems to grow in high numbers.